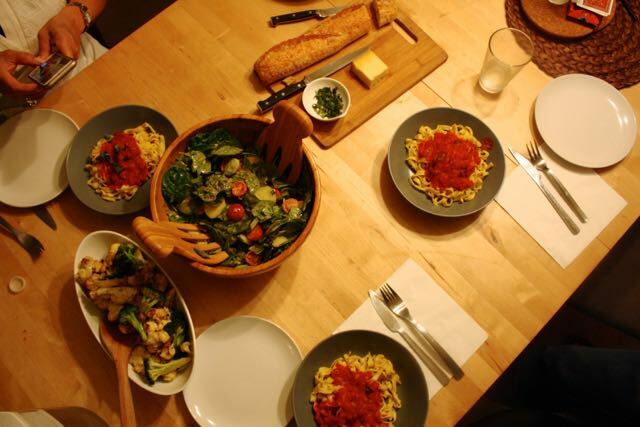 Pasta!!! I love it. I have this constant internal battle if I'm a rice girl or a noodle girl (cause I mean, I'm basically half made of rice ball). 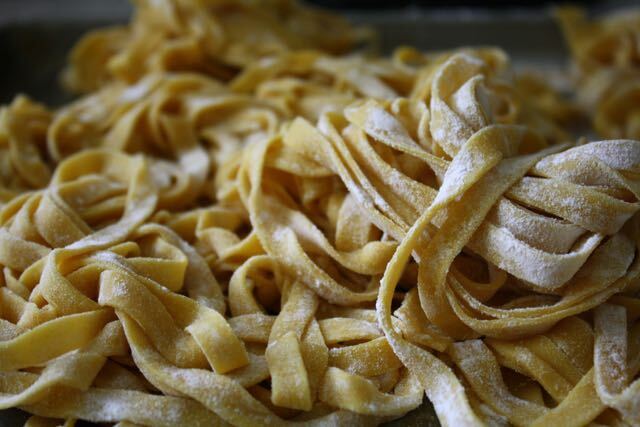 I just love the al dente chewiness of noodles and their amazing ability to soak up the flavors of whatever sauce you choose! Plus, you can feel like you're in Lady and the Tramp and play with your noodles and romantically share them till you get to the middle. 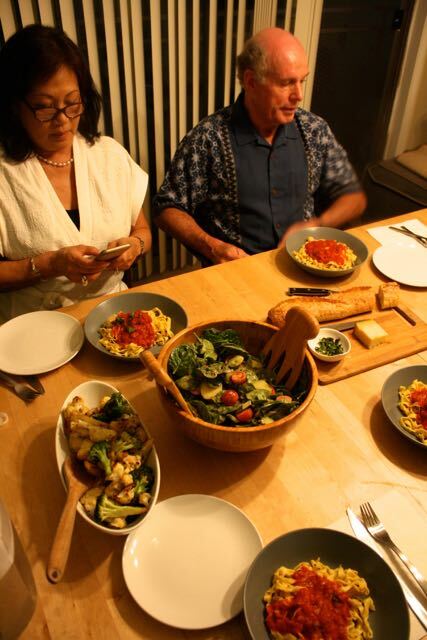 Unless you're eating dinner with your parents, in which case you leave all noodles on the plate. Like don't even pretend to share a noodle. When my aunt got us a pasta attachment I thought "OH THE POSSIBILITIES!!!!" 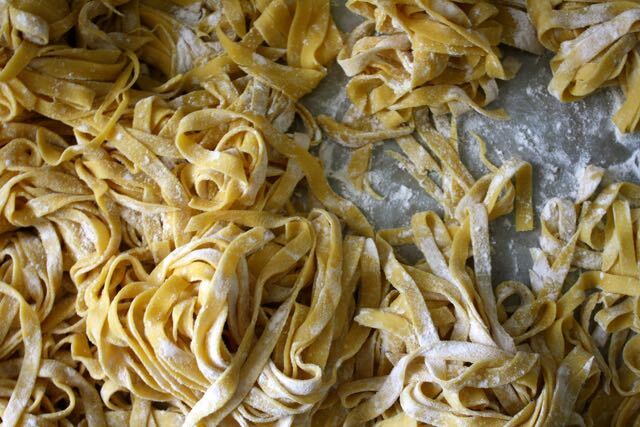 and here I am, feeling like Mario Batali (sans the orange crocs) whipping up fettuccine like there's no tomorrow. 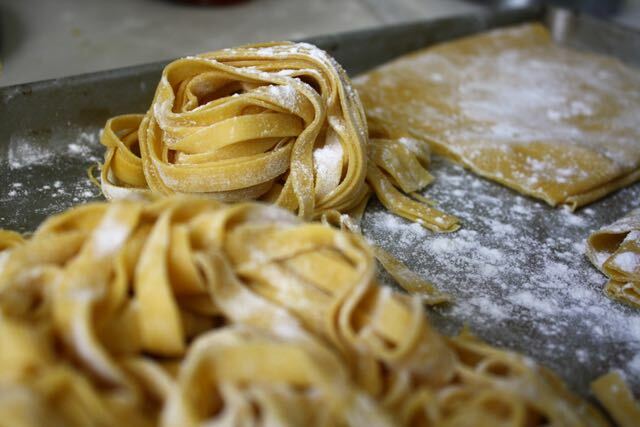 The best part of making pasta is you probably already have the ingredients in your kitchen: flour, eggs, salt, oil. Woot! Let's go! Place flour in the bottom of your mixer and add salt. Then turn the mixer on low and add one egg at a time till your dough is loosely incorporated. Drizzle in the olive oil and let mix with the paddle for 3-5 minutes till there's no wet or dry parts left. In the end and you should have a tight yellow dough. Place flour in a mound on a large clean surface and add salt. Create a well and crack your eggs in the middle with the olive oil. 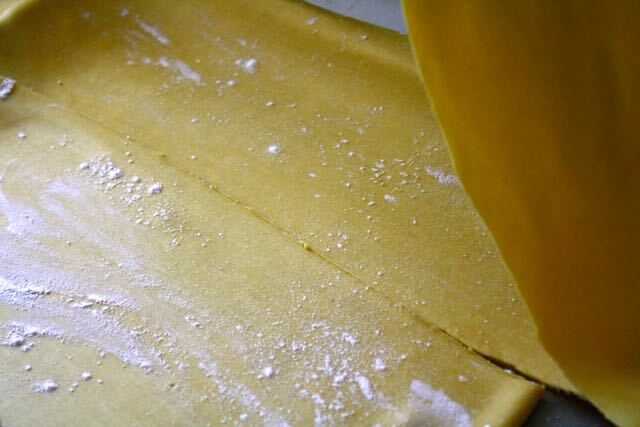 Then gently fold the flour into the center and mix with your fingers, keeping the integrity of the volcano shape, until you have less and less flour and your eggs begin to thicken. Then begin to really knead the dough back and forth till smooth, tight and yellow, 5 min. Once dough is complete, cut into two tennis ball sizes and wrap in plastic wrap and place in the fridge for at least 1 hour, the longer the better so the gluten can develop and the dough can chill. Once chilled, remove dough from wrap and cut off a piece about the size of a ping pong ball. 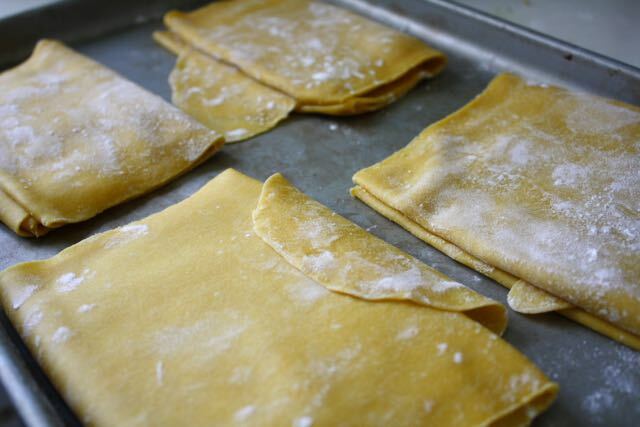 Wrap the rest of the dough to keep it from drying. 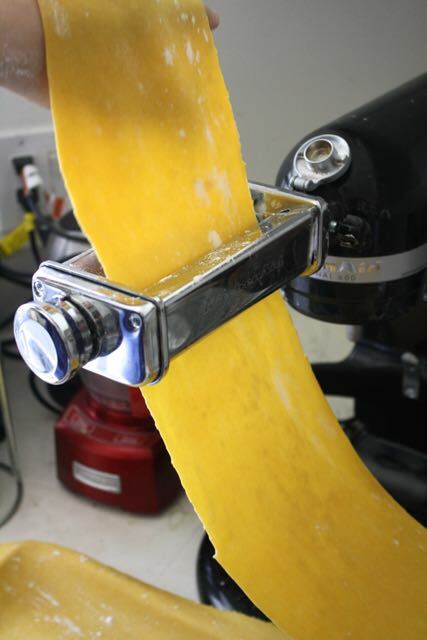 Roll out your small piece so it's long, just wide enough to fit in your pasta attachment (setting 1). 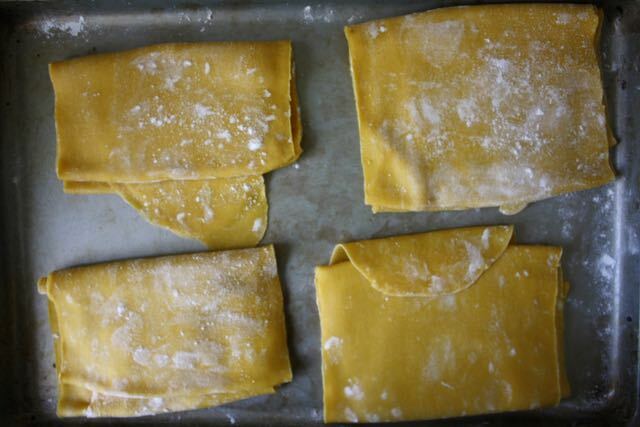 Then run the dough through the machine, fold it in half, and repeat, each time adjusting the setting up 1 notch (setting 2, 3, 4, 5). Be sure to flour it lightly between rounds. 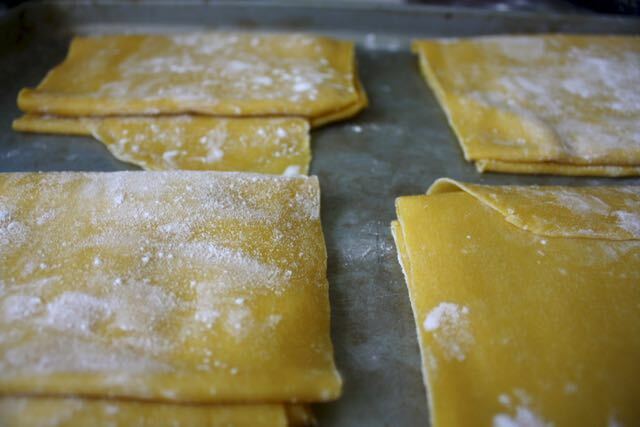 Once you have your sheet thin enough, repeat for the remaining dough, so you should have around 6-8 sheets of pasta dough. 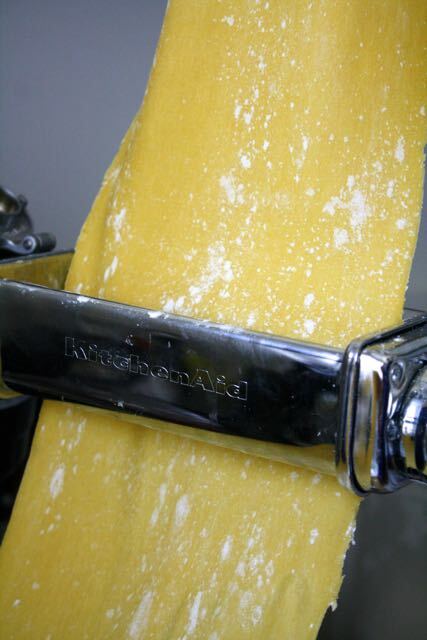 Then you can either add your spaghetti or fettuccine attachment and run the sheets through, or you can hand cut them for a rustic look. 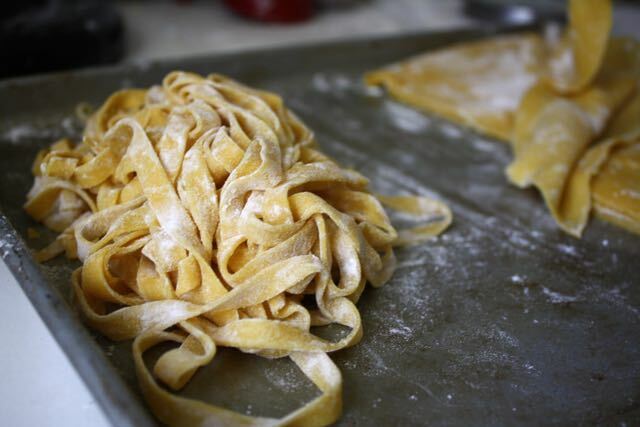 Lightly flour the noodles and place them on a cookie sheet, then chill them briefly in the fridge while you boil a pot of water, about 10 min. Once boiled, add the noodles and cook till they float to the top, about 1-2 minutes. Once they rise, they're cooked! Drain and add to your sauce so it absorbs all that tasty flavor. 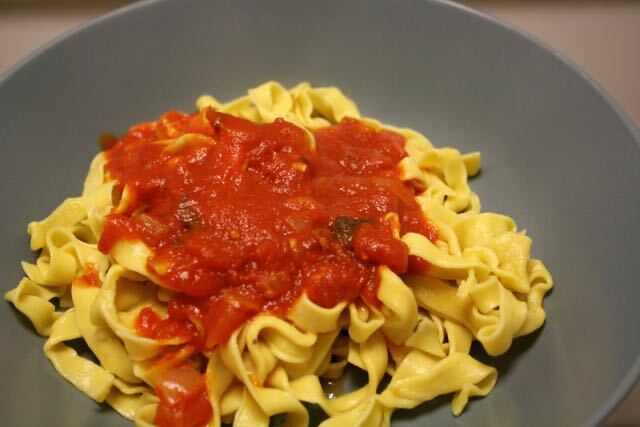 I did our classic garlic tomato sauce, or you could simply add to a pan with some butter, salt, and garlic with peas for a simple noodle dish.